Technology the solution to the food crisis? 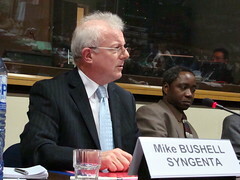 Brussels, 16 October 2008: In the 7th Brussels Development Briefing on rising food prices, Dr Mike Bushell from Syngenta provided a private sector perspective on how to feed the world. He argued that good technologies to increase yields already exist, but we have to deploy this technology safely in local sustainable agricultural systems. Wrapping up, Bushell stated that new technologies are a critical part of the solution. The technology we need is already here, the challenge is to integrate it into sustainable agricultural systems at the local level. Challenges we face include, above all, climate change, but also technophobia, a lack of infrastructure and finance, and extension services that need to be reinvigourated. He saw public private partnerships as instruments to help overcome the difficulties. It’s saved us before so I bet you anything it will save use again. Very interesting post – raises some interesting points for debate. I just stumbled upon your blog this morning and wanted to say that I have really liked browsing some of the posts. Anyways, I’ll be subscribing to your feed and I hope to read more very soon! Regional cooperation: A solution to Africa’s food crisis?